The ITIL Continual Service Improvement volume describes the importance of culture and advocates organizational change to align the enterprise to service goals. 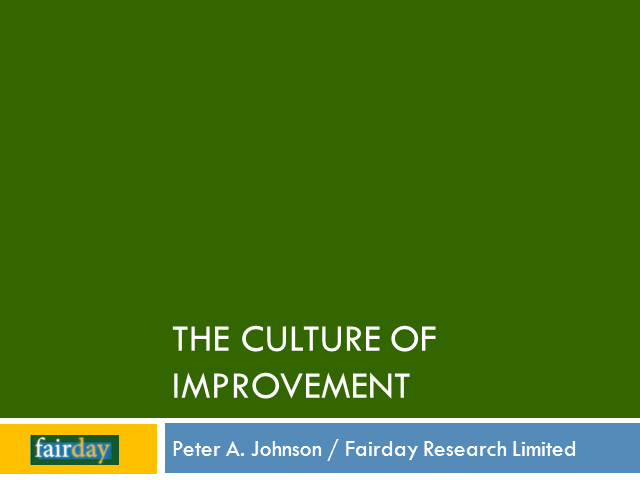 In this presentation the concepts of culture and change are examined in greater detail, and arguments are presented to suggest that 'culture change' is an enormous and perhaps risky endeavour. While the CSI volume partly acknowledges this and recommends starting with 'behaviour' change, this presentation describes specific aspects of organizational functioning which research evidence has linked to outcomes useful to CSI. Practical methods of how to use these are discussed.